The Okinawa General Bureau Northern National Highway Office has announced the Kin Town bypass road on Highway 329 will open to traffic on its whole length at 3 p.m. on March 30. The new road was constructed to alleviate congestion within Kin Town on Highway 329. 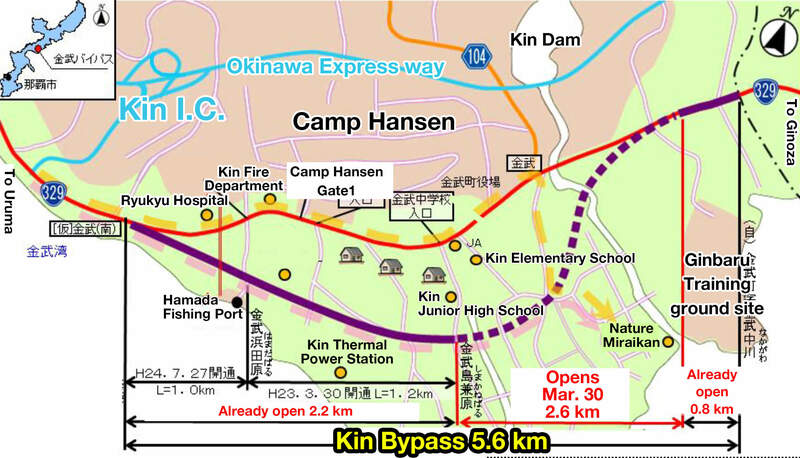 As the last 2.6-kilometer stretch between Nakagawa and Kaneshimabaru opens, the total 5.6-kilometer bypass will be complete allowing north and southbound drivers to avoid the center of Kin Town and the two gates of Camp Hansen completely. According to an estimate by the highway office, the new road will shorten the driving time between the Kin Exit of the Okinawa Expressway and Nature Miraikan by about 6 minutes.